(I think) I need a new phone - Hits and Mrs.
At a very young age (8 months turning 9 on the last week of March), Zee has exhibited signs of gadget freak-ness. Aside from her doll, she likes to tinker with the TV remote control, the landline, and the cellphone. One of my mom’s cellphone, the Nokia 8xxx (the small, un-colored phone) has fallen victim to her cute little hands. She held it, played with it, and threw it on the floor. What was once a survivor of many catastrophes is now a blank screen. Even if it’s turned on, we can’t see a dang thing. I let her play with my Sony Ericsson W300i, a gift from hubby two Christmases ago. It’s also survived mishaps and is still in good condition — until two days ago when I realized that the alarm wasn’t working anymore. I thought it was just because I almost drained its battery. But then, looking back, it’s not the first time I allowed my phone to go dead on me. And the first time my phone did not wake me up at the usual 4:30AM was the day after my cellphone fell from Zee’s crib, which was more or less two feet high from the floor. 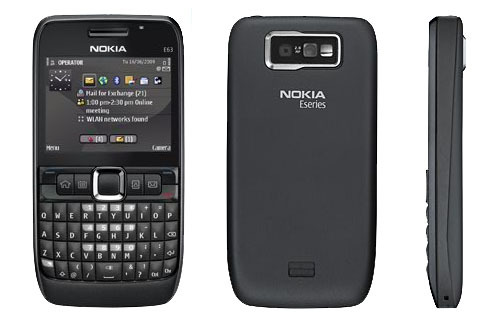 What I like about the Nokia E63 is that it has an Office Mobile. Of course, there’s the camera and Net feature, but it’s the Document Editor that really attracted me to it, aside from the price. It’s cheaper than the Samsung Omnia (which I also like) and Sony Ericsson Xperia. So if ever the time comes that I’ll be needing a new cellphone, this would be it. That’s just the beginning of a long trail of destruction, lol. If anything, having children forces us not to value material stuff too much. They all get broken anyway, hehe. My 1 year old nice likes anything with push button, the TV, the PC. magugulat na lang kami biglang nag-o-off yung TV o kaya yung PC. Lately he’s obsessed with the CDROM drive. Techie na ang mga bata ngayon. Hehehe. sorry, that’s supposed to be “niece”. actually, nephew pala dapat kasi lalaki sya. lol! hmmm… Joey broke my phone too, almost two years ago when he was about Zee’s age. Wow, it seems we’re all raising techie kids. My one-year-old knows how to turn on the TV and put her favorite DVD into the DVD player. She also sends blank texts to about 2 of my contacts once a week when I am too distracted to pry my cellphone off from her hands. Yay, technology!